This is a list of ergonomic computer equipment to keep in check when building an ergonomic workstation. See recommended Ergonomic Computer Equipment for your ergonomic workstation. 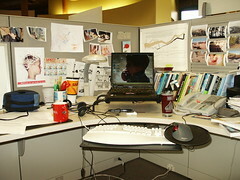 Besides ergonomic furniture, there are various types of ergonomic computer equipments; some of these are discussed here. If you are looking to buy one, then you can find lots of variety on ergonomic office equipment (computer) . An ergonomic keyboard arms are specifically designed support extensions used for holding the computer's keyboard. It is a movable piece allowing the user to maintain the correct posture when using keyboard to prevent carpal tunnel. Keyboard arms help prevent injuries to tendons and back muscles which are caused by repetitively typing. Perhaps the idea of keyboard arms came up when keyboard trays were being manufactured to provide more flexibility. Unlike keyboard trays, keyboard arms are not fixed and can be adjusted to left or right, up or down. Keyboard arms help in reducing the strain and fatigue. There are many types of keyboard trays available in the market. While typing, if you have to raise or extend your arms then it will put continuous strain and cause injury. If your upper arms are not hanging straight down from the shoulders then you are putting strain on your shoulders and neck. Moreover, leaning forward and tilting the wrists and forearms when typing will also put strain on your body. All these situations can be prevented if you use keyboard trays. These ergonomic computer equipment will allow you to maintain the correct posture thus minimizing the chances of an injury. Ergonomic document holders are very efficient ergonomic computer equipment for holding the document while you are typing. Moreover they reduce the clutter on your desk. By using a chair lumbar support, there would be minimum back muscle activity. When we put our thighs in a horizontal position, the lumbar curve of our lower back flattens thus forcing our back muscles to support the weight of our upper body. This results in putting an unnecessary load on our spine thus causing pain and fatigue. If we use an ergonomic chair lumbar support, the natural curve of our back gets support and thus reduces the risks of injuries and gives a relief to the spine. Wrist support brace is an effective way to relieve wrist pain caused due to repetitive strain being put on the wrists and carpal tunnel. This particular ergonomic computer equipment is a specially designed wrist brace which supports the wrist as well as the hand. It is recommended for people who have to use computer a lot. This Wrist Brace helps in the proper positioning of hand and wrist. It increases the circulation in the hand and provides comfort to the wrist by cushioning the underside of the wrist and ensuring the ergonomically correct position of the wrist. See buying options at Ergonomics Carpal Tunnel Recommended Products. Computer monitor Anti-Glare Filter is used to reduce the glare and improve the contrast of the computer monitor. There are two types of glare filters - the wrap around and the flat one; which type to choose depends upon which type of monitor you have and what are your preferences. A quality computer monitor glare filter should have an optical glass sheet instead of a plastic one. Moreover, it should have multilayer anti-reflective coatings. There are different types of light transmission in glare filters; choosing the right one depends upon the level of glare. If the glare level is high, the transmission level should be lower so as to reduce the glare. It is better to opt for an anti-static glare filter otherwise lots of dust would get accumulated on it. See a variety of monitor glare filter to buy. Thank you for reading 'Ergonomic Computer Equipment'! Go back to Ergonomic Computer Furniture.